It’s mid June as I write this. In Italy, where my mother is from, it’s nearly 30C. Here, in Suffolk, it’s 12C. And everybody’s complaining about it. So today, I decided to make some minestrone. Minestrone is peasant food. You’d make it out of the bits ‘n’ bobs of vegetables you had left over. As such, there are many different versions. This is the beauty of it really, which is that you can add more or less whatever veg you have. Use bits of broken pasta that you can’t use for anything else, etc. My mother makes an amazing minestrone, but she makes it using frozen veg. Which is quite inspired really when you consider that she lives in central London now, not on the edge of a vegetable patch. And the frozen veg is really fresh and delicious. I used to hate her minestrone (sorry Mamma, although the likelihood of you reading this is as high as the Vatican ever admitting it is wrong about anything) and the one and only time I was sent to bed without my dinner was when I, one evening, refused to eat it. I thought – and still think – this was quite harsh considering that I used to eat almost everything else. Including chickens’ feet and chickens’ stomach and tripe and brains. I mean, come on! Give me a break. Anyway, I love it now and this is how I make it. I’d love to say this is a recipe passed down from my Nonna, but nope, I got it from Waitrose. You can prepare each veg as you go along. Put the oil in a large saucepan and then add the pancetta/bacon. Once it’s beginning to colour, add the onion and cook gently until soft. Fry until soft. Add the carrot, then the celery, then the garlic, then the potato, then the courgette. At each stage add the veg and let it cook for a minute or two. Give the courgettes a couple of minutes, then add the chopped tomatoes. Fill the now empty tin with water, twice, and add to the minestrone. Now add the basil (if you don’t have it, don’t stress). Add parmesan rind and some pepper. If you don’t have the parmesan rind then add salt too. Bring to boil, lower to simmer. With lid off, simmer very gently for two hours. You can eat it after one hour but it’s so much nicer after two hours. Twenty mins before the end, add the beans if you want to use them (I’m not a mad fan of the beans, and prefer it without). If you’re planning on eating the whole lot in one go, also put the pasta in now, otherwise you get a better result cooking the pasta separately and adding it when you eat the minestrone. That’s it. I find this really therapeutic to make and deliciously wholesome to eat. This entry was posted in Soup, What's for lunch? 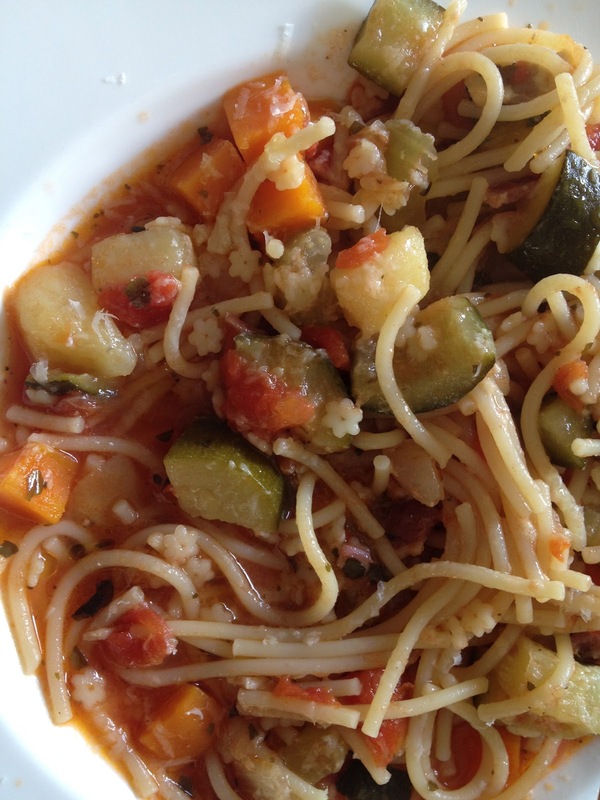 and tagged minestrone, soup, vegetables on June 12, 2012 by Annalisa Barbieri.